Few historical turning points are as rich in drama as the six months between February and August 1945, a period bookended by the Big Three conference in Yalta and the bombing of Hiroshima. A president died; a führer committed suicide; a prime minister who had rallied his people through the darkest days of their history was defeated in a free election. A war ended, empires crumbled, a new world order was proclaimed. A red tsar redrew the map of Europe, erecting a metaphorical “iron curtain” between East and West. Meeting in the capital of the defeated Third Reich, the victors squabbled over the spoils of victory. More than a century earlier, Alexis de Tocqueville had predicted that Americans and Russians would sweep all other nations aside. “The principal instrument of the former is freedom; of the latter, servitude,” the French seer wrote in 1835. “Their starting point is different and their courses are not the same; yet each of them seems marked out by the will of Heaven to sway the destinies of half the globe.” SIx Months in 1945 is the story of the people--presidents and commissars, generals and foot soldiers, victors and vanquished--who helped to realize "the will of heaven." The six months from Yalta to Hiroshima form a hinge between two very different wars--and two very different worlds. They connect the age of artillery with the age of the atomic bomb, the death throes of empire with the birth pangs of superpowers. They also mark the fateful encounter in the heart of Europe between the armies of two great nations, ostensibly allied but guided by opposite ideological principles. The end of World War II led inexorably to the start of the Cold War. 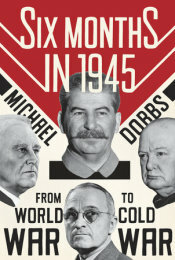 Michael Dobbs brings to life the remarkable leaders--FDR, Stalin, Churchill, Truman--who dined, charmed and quarreled with each other against the backdrop of the ruined palaces of the Crimea and Soviet-occupied Berlin. He marshals new archival evidence to challenge the theories of both traditional and revisionist historians, showing that the Cold War was the inevitable consequence of the clashing political and ideological ambitions of two emerging superpowers. Berlin and Potsdam in July 1945. "I am interested in hinge moments in history, the time when one era ends and another begins." Two very different nations, America and Russia, met in the heart of Europe in 1945. The result was an extraordinary clash of cultures, ideologies, and personalities. By the summer of 1945, friendship was already turning to rivalry, and even emnity. Click on thumnails to view individual slides.